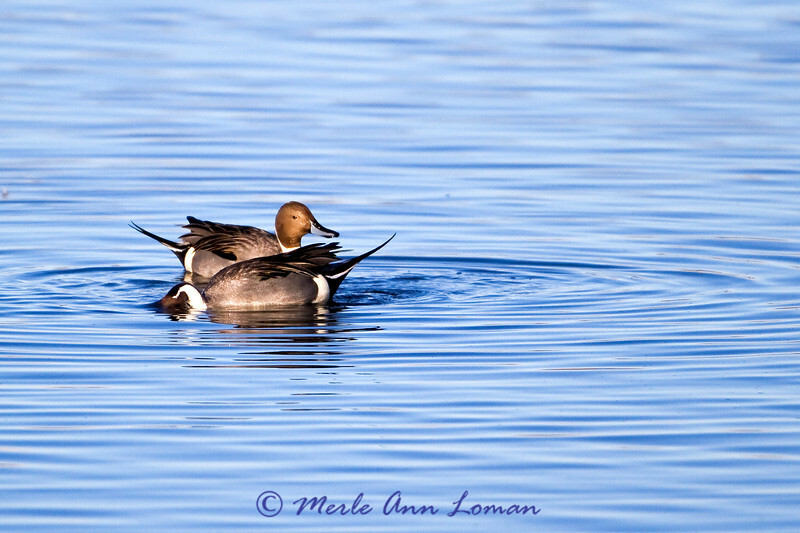 The Northern Pintail is a medium-sized dabbling duck that lives year-round in western Montana. Both sexes are distinguishable from other dabblers by their slim profile, long narrow neck, and pointed tail. Both sexes have a dull black bull, sometimes mottled; dark brown eyes and gray legs. Plumage of the male and female is different. Plumage of a breeding male is distinct making him easy to identify. He has a chocolate brown head, white neck and underparts, and very long central tail feathers. At the rear of wing (speculum), the feathers are a bronzy greenish color with a black band and white rear edge. Non-breeding males are duller colored overall. The female can be distinguished from other female ducks by slender proportions, plain tan face and pointed tail. Her wings are a mottled dull brown or bronze color, rarely with some green on the rear of her wing. 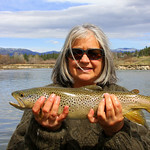 This species nests earlier than most ducks in Montana, beginning soon after ice-out. The nest is a scrape in the ground in brush or grass and lined with grass and/or down. It is usually not placed near water. This photo is taken at the Lee Metcalf National Wildlife Refuge near Stevensville, Montana USA. The open country with shallow wetlands and low vegetation provides perfect habitat for these ducks and many other species of waterfowl.